4 And the Spirit said unto me: Believest thou that thy father saw the tree of which he hath spoken? 5 And I said: Yea, thou knowest that I believe all the words of my father. 6 And when I had spoken these words, the Spirit cried with a loud voice, saying: Hosanna to the Lord, the most high God; for he is God over all the earth, yea, even above all. And blessed art thou, Nephi, because thou believest in the Son of the most high God; wherefore, thou shalt behold the things which thou hast desired. 7 And behold this thing shall be given unto thee for a sign, that after thou hast beheld the tree which bore the fruit which thy father tasted, thou shalt also behold a man descending out of heaven, and him shall ye witness; and after ye have witnessed him ye shall bear record that it is the Son of God. 8 And it came to pass that the Spirit said unto me: Look! And I looked and beheld a tree; and it was like unto the tree which my father had seen; and the beauty thereof was far beyond, yea, exceeding of all beauty; and the whiteness thereof did exceed the whiteness of the driven snow. 11 And I said unto him: To know the interpretation thereof -- for I spake unto him as a man speaketh; for I beheld that he was in the form of a man; yet nevertheless, I knew that it was the Spirit of the Lord; and he spake unto me as a man speaketh with another. 13 And it came to pass that I looked and beheld the great city of Jerusalem, and also other cities. And I beheld the city of Nazareth; and in the city of Nazareth I beheld a virgin, and she was exceedingly fair and white. 14 And it came to pass that I saw the heavens open; and an angel came down and stood before me; and he said unto me: Nephi, what beholdest thou? Chapter 11 – “’The Lamb of God’ in Pre-Christian Texts.” Research by John W. Welch, originally published as a FARMS Update in Insights (August 1998): 2. Taken from research by J.C. O’Neill, “The Lamb of God in the Testaments of the Twelve Patriarch,” Journal for the Study of the New Testament 2 (1970): 2-30. McNeill “contends that the phrase Lamb of God was not a Christian invention, as some scholars have supposed, but was rooted in earlier Jewish language and imagery. His main evidence comes from the Testament of Joseph, a Jewish text probably from the second century B.C. 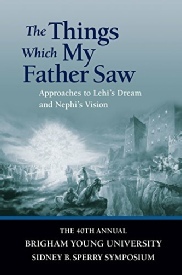 Welch points to nearly a dozen parallels between Nephi’s vision and the vision of Joseph the son of Israel, as recorded in Testament of Joseph 19. Joseph’s Testament records that a virgin bore a lamb, who destroyed the beasts. Chapter 10 – Lehi’s Dream as a Template for Understanding Each Act of Nephi’s Vision, by Amy Easton-Flake. The author explains, “Nephi’s vision may be better understood as a four-act play,” and in each of the acts we may find the imagery of Lehi’s dream. Nephi as author presents the familiar symbols in different historical contexts, thus “revealing new layers of meaning for each of the symbols.” As a reader, I was excited to explore this idea for myself, and make my own chart of the various symbols as represented in the different acts of Nephi’s vision. 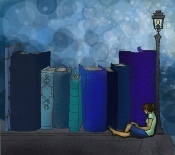 23 And he spake unto me, saying: Yea, and the most joyous to the soul. 24 And after he had said these words, he said unto me: Look! And I looked, and I beheld the Son of God going forth among the children of men; and I saw many fall down at his feet and worship him. 25 And it came to pass that I beheld that the rod of iron, which my father had seen, was the word of God, which led to the fountain of living waters, or to the tree of life; which waters are a representation of the love of God; and I also beheld that the tree of life was a representation of the love of God. 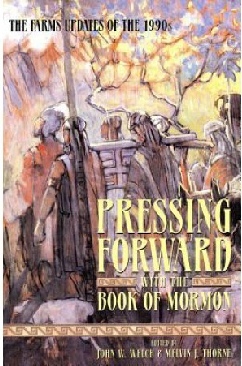 Chapter 10 – “Rod and Sword as the Word of God.” Research by John A. Tvedtnes, originally published in the Journal of Book of Mormon Studies 5/2 (1996): 148-55. 26 And the angel said unto me again: Look and behold the condescension of God! 27 And I looked and beheld the Redeemer of the world, of whom my father had spoken; and I also beheld the prophet who should prepare the way before him. And the Lamb of God went forth and was baptized of him; and after he was baptized, I beheld the heavens open, and the Holy Ghost come down out of heaven and abide upon him in the form of a dove. 28 And I beheld that he went forth ministering unto the people, in power and great glory; and the multitudes were gathered together to hear him; and I beheld that they cast him out from among them. 29 And I also beheld twelve others following him. And it came to pass that they were carried away in the Spirit from before my face, and I saw them not. 30 And it came to pass that the angel spake unto me again, saying: Look! And I looked, and I beheld the heavens open again, and I saw angels descending upon the children of men; and they did minister unto them. 31 And he spake unto me again, saying: Look! And I looked, and I beheld the Lamb of God going forth among the children of men. And I beheld multitudes of people who were sick, and who were afflicted with all manner of diseases, and with devils and unclean spirits; and the angel spake and showed all these things unto me. And they were healed by the power of the Lamb of God; and the devils and the unclean spirits were cast out. 32 And it came to pass that the angel spake unto me again, saying: Look! And I looked and beheld the Lamb of God, that he was taken by the people; yea, the Son of the everlasting God was judged of the world; and I saw and bear record. 33 And I, Nephi, saw that he was lifted up upon the cross and slain for the sins of the world. 34 And after he was slain I saw the multitudes of the earth, that they were gathered together to fight against the apostles of the Lamb; for thus were the twelve called by the angel of the Lord. 35 And the multitude of the earth was gathered together; and I beheld that they were in a large and spacious building, like unto the building which my father saw. And the angel of the Lord spake unto me again, saying: Behold the world and the wisdom thereof; yea, behold the house of Israel hath gathered together to fight against the twelve apostles of the Lamb. 36 And it came to pass that I saw and bear record, that the great and spacious building was the pride of the world; and it fell, and the fall thereof was exceedingly great. And the angel of the Lord spake unto me again, saying: Thus shall be the destruction of all nations, kindreds, tongues, and people, that shall fight against the twelve apostles of the Lamb. 1 And it came to pass that the angel said unto me: Look, and behold thy seed, and also the seed of thy brethren. And I looked and beheld the land of promise; and I beheld multitudes of people, yea, even as it were in number as many as the sand of the sea. 2 And it came to pass that I beheld multitudes gathered together to battle, one against the other; and I beheld wars, and rumors of wars, and great slaughters with the sword among my people. 4 And it came to pass that I saw a mist of darkness on the face of the land of promise; and I saw lightnings, and I heard thunderings, and earthquakes, and all manner of tumultuous noises; and I saw the earth and the rocks, that they rent; and I saw mountains tumbling into pieces; and I saw the plains of the earth, that they were broken up; and I saw many cities that they were sunk; and I saw many that they were burned with fire; and I saw many that did tumble to the earth, because of the quaking thereof. 5 And it came to pass after I saw these things, I saw the vapor of darkness, that it passed from off the face of the earth; and behold, I saw multitudes who had not fallen because of the great and terrible judgments of the Lord. 6 And I saw the heavens open, and the Lamb of God descending out of heaven; and he came down and showed himself unto them. 7 And I also saw and bear record that the Holy Ghost fell upon twelve others; and they were ordained of God, and chosen. 9 And he said unto me: Thou rememberest the twelve apostles of the Lamb? Behold they are they who shall judge the twelve tribes of Israel; wherefore, the twelve ministers of thy seed shall be judged of them; for ye are of the house of Israel. 10 And these twelve ministers whom thou beholdest shall judge thy seed. And, behold, they are righteous forever; for because of their faith in the Lamb of God their garments are made white in his blood. 11 And the angel said unto me: Look! And I looked, and beheld three generations pass away in righteousness; and their garments were white even like unto the Lamb of God. And the angel said unto me: These are made white in the blood of the Lamb, because of their faith in him. 12 And I, Nephi, also saw many of the fourth generation who passed away in righteousness. 15 And it came to pass that I looked and beheld the people of my seed gathered together in multitudes against the seed of my brethren; and they were gathered together to battle. 16 And the angel spake unto me, saying: Behold the fountain of filthy water which thy father saw; yea, even the river of which he spake; and the depths thereof are the depths of hell. 17 And the mists of darkness are the temptations of the devil, which blindeth the eyes, and hardeneth the hearts of the children of men, and leadeth them away into broad roads, that they perish and are lost. 18 And the large and spacious building, which thy father saw, is vain imaginations and the pride of the children of men. And a great and a terrible gulf divideth them; yea, even the word of the justice of the Eternal God, and the Messiah who is the Lamb of God, of whom the Holy Ghost beareth record, from the beginning of the world until this time, and from this time henceforth and forever. 19 And while the angel spake these words, I beheld and saw that the seed of my brethren did contend against my seed, according to the word of the angel; and because of the pride of my seed, and the temptations of the devil, I beheld that the seed of my brethren did overpower the people of my seed. 21 And I saw them gathered together in multitudes; and I saw wars and rumors of wars among them; and in wars and rumors of wars I saw many generations pass away. 22 And the angel said unto me: Behold these shall dwindle in unbelief. 23 And it came to pass that I beheld, after they had dwindled in unbelief they became a dark, and loathsome, and a filthy people, full of idleness and all manner of abominations.